I look for any excuse to add Anderson Cooper’s charismatic face to my blogging site. I have tremendous respect for his brand of reporting – his humble, yet assertive demeanor makes for an intriguing “watch and listen”. However, truth be told, I admire the collective intelligence and expertise which all the CNN anchors bring to their Individual shows. They work, oftentimes, under immense pressure and the measured scrutiny of their audience and experts in various fields. It is not a job for the faint of heart and they have earned their place in the sun. So, Monday’s show allows them to have a little fun while, at the same time, earn some money for their favorite charities. 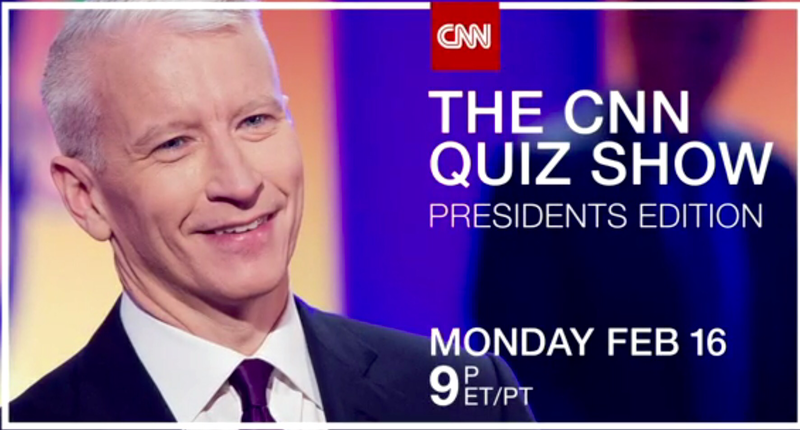 In honor of President’s Day, three teams of CNN anchors will battle it out for charity in a wild quiz show that tests their knowledge of Presidential trivia on Monday at 9p ET/PT. The teams are comprised of John Berman and Erin Burnett (competing for Save the Children), Alisyn Camerota and Jake Tapper (for Homes for Our Troops) and Chris Cuomo and Don Lemon (for HELP USA) and will be hosted by Anderson Cooper. You can check out the CNN Quiz Show Trailer here. It looks like it is going to be a lot of fun and educated fun at that! Are you tuning in? Please share in the comments section.